I really don’t know how to summarize this book. Fantasy, magical realism…some new combination of both? Once I quit trying to categorize it, I had so much fun reading! The story follows Finn, who is haunted by the disappearance of Roza, a mysterious young woman who’d been living with Finn and his older brother, Sean. Finn witnessed Roza’s abduction, but because he can’t describe the man who took her, no one in the town of Bone Gap believes him. This story is 100% unique, unlike anything I’ve read before. All the characters are multidimensional and strong in their own way. My favorite hands down is Petey, a beekeeper like her mother. I loved reading about her as a character, as well as her relationship with Finn. 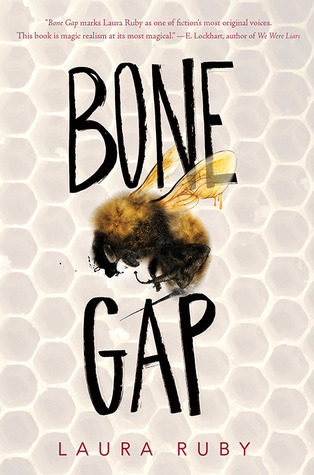 BONE GAP won the Printz Award (right after I finished reading it), and it’s so well-deserved. Beautifully written book. Keep a wide open mind, don’t try to label it, and give it a read! Sign into Goodreads to see if any of your friends have read Bone Gap.